Marciano Art Foundation is excited to announce its second artist project, a site-specific installation created for the foundation’s expansive first floor Theater Gallery. Maurice and Paul Marciano have invited renowned interdisciplinary artist Olafur Eliasson for his first major exhibition in Los Angeles, in over a decade. Eliasson’s art–comprising sculpture, painting, photography, film, and installation–is driven by his interests in perception, movement, embodied experience, and feelings of self. For his exhibition at the foundation, titled Reality projector (2018), Eliasson has conceived of a seemingly simple, yet complex installation that uses projected light and the existing architecture of the space to create a dynamic shadow play. 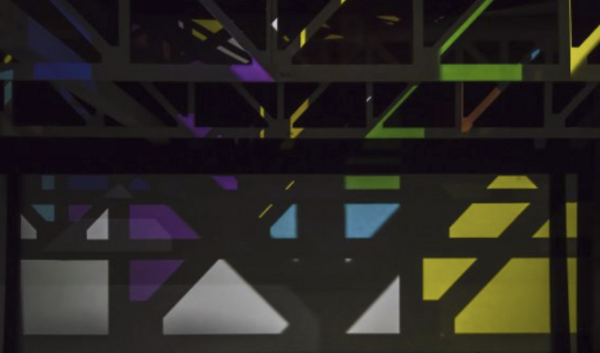 The artwork references the space’s former function as a theater as well as the history of filmmaking in the city by turning the entire space into an abstract, three-dimensional film. Eliasson’s exhibition offers visitors the opportunity to fully experience the magnificence of the space free of objects. Reality projectorwill be on view beginning March 1, 2018 and will remain on view until August. Eliasson strives to make the concerns of art relevant to society at large. Art, for him, is a crucial means for turning thinking into doing in the world. Not limited to the confines of the museum and gallery, his practice engages the broader public sphere through architectural projects and interventions in civic space. Due to these interests and the experiential nature of his work, Eliasson was a natural choice to create a site-specific installation in the distinctive 13,500 square-foot space.